In Harmony, you can export Exports a scene as a bitmap image sequence. If there is sound in your scene, it will not be exported with the images. If you want to export images with transparency, you need to select the file type that supports this option, such as .tga, .psd or .png. 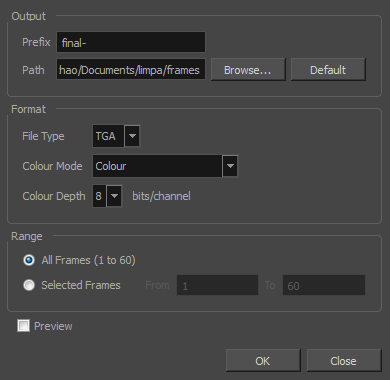 Harmony supports 16 bits per channel RGB and RGBA .png files. The Colour Mode menu changes according to the File Type selected. For example, selecting .tif will result in only having "Colour" as a Colour Mode option, whereas .png will have "Colour" and "Colour with Transparency". From the top menu, select File > Export > Images or press Ctrl + Shift + Y (Windows/Linux) or ⌘ + Shift + Y (Mac OS X). In the Output section, choose a prefix. The prefix is the file name. Each image in the sequence will have this name, plus a sequence number and file format extension. For example: final-0001.jpg. Click Browse and specify the location in which your movie will be saved. The default location is the file directory’s frames folder. In the Format section, choose the File Type, Colour Mode and Colour Depth from their respective menus. In the Range section, select the Frame Range to render. All Frames: Exports export the entire scene. Selected Frames: Lets you specify the first and last frame of the frame range to export. Select the Preview option to see the images being rendered. If you selected the Preview option, a generic player opens so you can watch the image sequence strung together as a video. The image sequence is now available in the scene’s frames directory. You should be able to preview each frame as an individual image. Open the Export Images dialog box. In the Format section, select Colour with Transparency from the Colour Mode menu.